The Halloo Find-Me, Follow-Me feature connects incoming calls to you based on your call forwarding setup. Each user in your account will program one or more lines, corresponding to their home, office and mobile numbers and rules to tell the system where they are currently located and when they plan to change locations. Sign in to My Halloo website. Select the User Settings → Forwarding tab. Enter your “Home”, “Office”, and “Mobile” numbers into the form and click Save Changes. (Optional) Select the Schedule tab to enter time based “follow-me” rules so that your calls are automatically routed to you based on your weekly schedule. 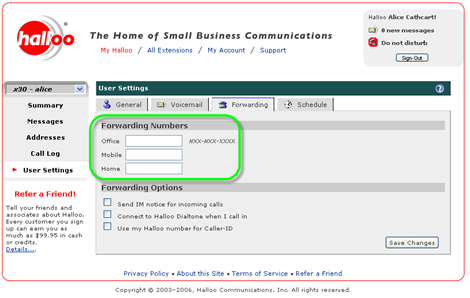 Select your current location in the Fwd: menu of the Call Control Panel at the top of the My Halloo page. Note: The Control Panel Fwd: shows you your current forwarding location. Changes to the location take effect immediately and do not require you to click a Save Changes button. If you manually change the location, the change will last until the next scheduled forwarding update as set in the Follow-Me Schedule. You normally work in your office from 8am–5pm. Suppose you leave the office at noon for an outside meeting and would like to take calls on your mobile phone. Change your current forward-to location in the My Halloo Website or Dialtone and your calls will immediately forward to your mobile phone. The system will continue to forward calls to your mobile phone until you manually change it back, or a schedule rule kicks in. In this example, at 5pm, the system will begin sending calls to your voicemail. Further information about this topic can be found in the Call Forarding chapter of this guide. From the My Halloo Dialtone, press to enter the Call Assistant system. You will hear an announcement telling you how your calls are being handled at present. You will be given the option to change your forwarding preference. Follow the prompt and make your forwarding selection. Your calls will be forwarded to the new selection until the next time a scheduled find-me rule is triggered.